With Troi File Plug-in 8.6 for FileMaker Pro you can easily add the icons of files on your disk to your FileMaker app. To do this you use the TrFile_GetIcon function. It can create icons in sizes varying from 16×16 to 1024×1024 pixels and even with double resolution for retina screens. The newly released Troi Text Plug-in 4 for ‪#‎FileMaker‬ Pro 14 adds customizable (or is it customisable?) spelling functions per field. You can implement this from a calculation, for example in a script or in a calculation field. You can also ignore, learn and unlearn words, from a script. Can you parse out XML data in FileMaker Pro in one step? If you regularly have to work with XML formatted data in FileMaker Pro®, getting the relevant parts of that data, and putting it into text fields can be a daunting task. And you would probably say it is impossible to get a node of the XML out in one step as it would need a lot of script steps. But that is not the case if you use a plug-in. It can be done if you install Troi Text Plug-in. This plug-in adds a function TrText_XML( ) to your arsenal of tools. The function has three parameters: the first parameter specifies the action to take, in this case to get a node from the XML. The second parameter specifies which node you want to get. Finally the third parameter is the XML data you want to parse. If you want to meet FileMaker Plug-in makers in person: Troi Automatisering is going to the FileMaker Developer Conference in Las Vegas this year. We will have a booth at the Product Showcase and hope to show you all the exiting new stuff we have with the Troi Plug-ins for FileMaker Pro. The FileMaker DevCon 2016 will be held July 18-21, 2016 at The Cosmopolitan of Las Vegas, Nevada. Today we released an updated version of Troi File Plug-in, our plug-in for manipulating external files and folders directly from FileMaker Pro. This is a maintenance update, which has a few bugfixes and improvements in the Search, GetDate and Metadata functions. Upgrading to version 8.0.1 is free for all users of version 8.0. 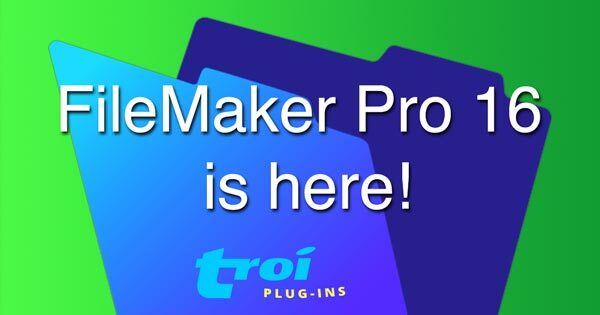 Troi File Plug-in 8.0 for FileMaker Pro 14! Today we released Troi File Plug-in 8.0, which adds support for 64-bit architecture with FileMaker Pro 14. We rewrote the plug-in so the TrFile_SelectFileDialog, TrFile_SelectFolderDialog and TrFile_SaveFileDialog functions are now available for you to use too. With Troi Serial Plug-in you can receive data sent from an external device with a serial (RS232) interface in FileMaker Pro. You can have the plug-in start a script upon receiving in order to process the received data in your database. Assume you have an external serial device connected to a (virtual) serial port on your computer. You can use a serial-USB adapter to connect to a USB port on your computer, which will then act as a virtual serial port. This will open the COM1 port.